Right guys, this should help you along with getting your wardrobe 'Spring / Summer Ready'. Delivery is £1.99 per order, or free on orders over £30. 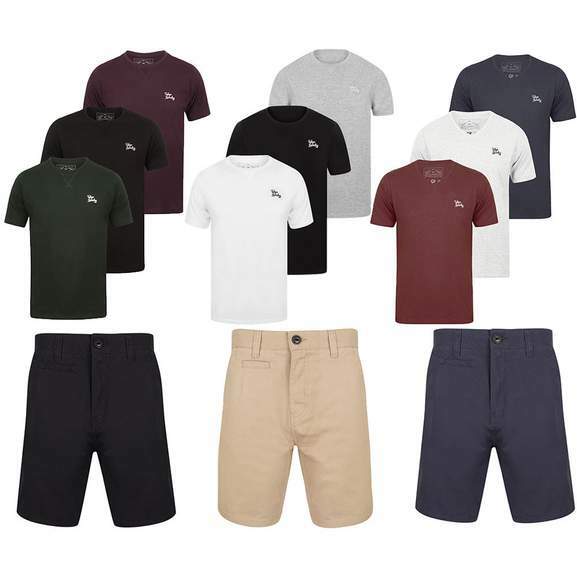 8 pairs of shorts, and 6 T-Shirt bundles to choose from, there's some really nice colours. Does anyone know what the tops fit like? Particularly tight or baggy? I purchased these (the t-shirts) on a previous hotukdeals offer and they are somewhere in between, not skin tight like a stretch fit but not baggy. The bigger issue though is you might get 2 maybe 3 washes out of them (even on 30c) before they are completely out of shape and halve way up your back. Tokyo laundry stuff is such awful awful quality it’s not a deal even at half price or more. A wash or two and it all deforms, shrinks and wraps and falls apart. Only one thing its it’s good for is buying to take on holiday and then ditch as its cheaper than washing clothes out there. I purchased these (the t-shirts) on a previous hotukdeals offer and they …I purchased these (the t-shirts) on a previous hotukdeals offer and they are somewhere in between, not skin tight like a stretch fit but not baggy.The bigger issue though is you might get 2 maybe 3 washes out of them (even on 30c) before they are completely out of shape and halve way up your back. these look like a great deal..... guys are the shirts really that bad? do they go really baggy after one wash or do they shrink? Tokyo Laundry stuff represents the quality of Primark, sometimes far worse - like cheapest H&M. these look like a great deal..... guys are the shirts really that bad? do …these look like a great deal..... guys are the shirts really that bad? do they go really baggy after one wash or do they shrink? They shrink, after 3 washes totally unwearable. I'd recommend Charles Wilson though their quality is amazing, I've got t-shirts from them from over 8 years ago and still in shape and size. There was a deal on here not long ago and they always run deals on multi-packs, you can usually pick 5 t-shirts up for £20(ish) in the sales and cleareance section and they will last you years. I honestly don't bother with anything else now when I need just some plain everyday t-shirts. The clothes really are as awful as the comments usually suggest.They will survive two washes max before getting all mishapen and deformed. Tokyo laundry stuff is such awful awful quality it’s not a deal even at h …Tokyo laundry stuff is such awful awful quality it’s not a deal even at half price or more.A wash or two and it all deforms, shrinks and wraps and falls apart. Only one thing its it’s good for is buying to take on holiday and then ditch as its cheaper than washing clothes out there. You are supposed to send them to Japan to be washed, it's in the name. If you add code New20 first then add Spring it seems to give you free delivery rather than the £1.99. I purchased a few of these for my holidays last year and after only one or two wash`s....They distorted in shape badly. I really would not buy these now ... once they are washed......They are toast. I just realized that these are for the t-shirt variety My reference was concerning the polo shirt variety which I thought these where...So can`t really comment on the quality...But I suspect they will be toast too after a few wash`s......considering the comments here. Quality isn't bad at all , bought polos /shirts/tshirts..out of the blue still going strong for months . If you add code New20 first then add Spring it seems to give you free …If you add code New20 first then add Spring it seems to give you free delivery rather than the £1.99.